A week before WPX I got a phone call on my cell while in Dayton. It was Sinisa VA3TTN who was talking about possibility of entering a multi-single from VE3UOW at the University of Waterloo. Location survey revealed a TH6 and few dipoles at the location. TH6 was mounted on top of 30 ft tower but with Coax cable hanging down altogether with SO239 from the broken HyGain balun. Rotor didn't work either and one piece of 10-meter reflector was missing. We had only three days (evenings) to prepare things as best as we could. First thing was to figure out if TH6 would actually work. We decided to try attaching a Coax balun to TH6 on Tuesday night and see how well will TH6 behave electrically. I drove from Toronto to Waterloo on Tuesday evening after work. It was already dark and the rain was pouring down on us. Murphy was looking down at us with a piece of magnifying glass. VA3TTN had things already prepared - newly wounded coax balun and some tools. I strapped myself in the safety belt borrowed from VE3FF, stashed some tools in my pockets and went up the tower. Although the tower was old and the guying wires seemed a bit rusty, the tower was able to withstand my 200 pounds. After 30 minutes on the tower, we managed to strap the balun to the boom with the duct tape, attach the clamps on the radiator next to the old rusty clamps holding the wires from the BN-86 balun and beta rods together. We also pointed the beam towards EU and tightened the loose bolts on the rotor. Wires from the BN86 were cut but the balun itself remained attached to the boom. Back in the shack all wet but happy to be in warm and dry room again. 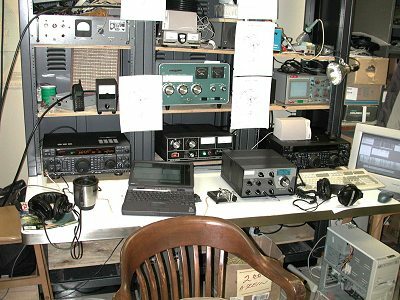 We quickly attached TH6 to an TS 830 found in the shack. We were delighted to find out that the SWR was excellent on all bands. Quick comparison between TH6 and 20 meter dipole which VA3TTN installed earlier revealed several S units difference of TH6 over the dipole. Sinisa VA3TTN already had a plan to make one 80 meter dipole and two 40 meter dipoles. One for EU and other one for JA. Next day evening I was back with my FT1000MP, MLA2500 and R5 vertical. We were going to use R5 for chasing the mults with multiplier station. Dragan VE3FF came also to the rescue and offload some of the work. Next two days we were working until some wee hours. On Wednesday night we hooked up Dentron amp to check the antennas out for any RF problems. We tried the beam too and the moment when the SWR meter needle passed above 400W mark, TH6 just went silent. All those sound signals were gone. Even barefoot rig wouldn't tune any longer. Next day Sinisa and Iulian, VA3IUL tried fixing it. After pulling PL259 from both ends of the feedline and finding nothing wrong with them, they discovered that the cable was joined somewhere in the middle and it was spoiled with water. They chopped about 3 feet of bad cable and replaced the PL259s. Finally all antennas were up and running. By the time we left the site on Friday early morning, we had 4 dipoles , R5 Cuschraft vertical and TH6 all working. 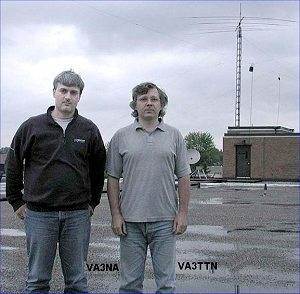 All antennas had baluns made by VA3TTN. Some of them are really big. As you approach the campus you may actually see the baluns first hanging in the air before you see the yagi :-). Nice folks at U of W provided us with two LAN drops in the shack for Internet access. We were going to use two computers running Writelog. One PC would make outgoing telnet connection to DX packet cluster thus providing for DX spots feed for both of them. The only thing left for me was to make two cables for Rig keying and radio control and locate second PC for Writelog network. I was going to do that on Friday as we used all of our available time working on the antennas. I had a bit of trouble finding a suitable PC for second radio. The time was running out and I took one of my Linux PCs, unplugged its hard disk and attached one spare junky 1Gb disk letting it hanging down on the side of the PC on the ribbon cable. Quickly installed Windows 98, Writelog and configured the Network card. After a bit of tweaking two PCs finally saw each other and Writelog established successful connection. Left the house at 6 PM working my way through usual Friday rush hour. Got there just one hour before the start of the contest. We had to hook up two radios, two amps and two PCs together. Sinisa and I frantically started assembling the station. Main radio and MLA were fired up minutes before the start. I guess I am the only MP owner in the whole world who never realized that one can't use PC keying and Yaesu MP's internal keyer at the same time. What a bummer. I had to keep the keyer off, and turn it back on every time I wanted to use the key paddles. I got this radio just few weeks ago and didn't really have the time to try all things out properly. Next thing I discovered when I first keyed up the radio and the amp from the PC is that it would just "key-down" the radio (and amp) and not let go. The only way to quickly revert this was to cycle the radio off and back on. When I built the cables I tested them with barefoot radio as the MLA was already on-site. VA3TTN and VE3FF went out somewhere and figured out that the optocoupler which I have used (4N33 from the Writelog manual) was not the best one for this job and came up with different type (4N28) which worked just fine. Don't have to say much for the contest itself. 15 was the band to be on for this one. Too bad the activity on low bands was somewhat limited. On low bands, for VE stations even every US station is a 4 pointer comparing to 3 DX points on high bands. The runs were decent although not great, especially the second day. EU stations were everywhere, which was helpful as we had no rotor. This was also a first contest tryout for my recently acquired MP. This radio indeed has a number of quirks. One annoyance was that every time you push any pushbutton on the front panel it interrupts the reception for about 100ms (as measured by VA3TTN). This probably results from the beep being turned off, but receive audio not turned on. Other than that I think the receiver passed the test with flying colors. Equipped with Inrad 400 Hz filters it really stood up well against the chaos on the bands on the contest weekend. I was trying to use sub-receiver to pick up some mults too and it worked out for me but it took me some time to get used to it. WriteLog network also worked fine without any major problems. Telnet connection to the DX cluster was reliable and Writelog bandmaps were quickly filling up with spots. VA3TTN didn't like WriteLog much seeing it for the first time, but he is just that kind of a guy - guy who likes to write his own logging software, his own DSP code for outboard audio CW filters, to build his own baluns and antennas, to hack the Inrad filters on his own and modify the radio on his own. I am solving all this problems in much different way by swiping my beloved credit card and patiently waiting for the mailman to bring me that next VISA statement:-)). For the end, there is some score analysis to be done but we have a lot of room for improvement. Time management, antenna work, etc. Nevertheless we had great fun working in the contest. We greatly appreciate the help from VE3UOW members, particularly Ed Spike VE3TCK, Roger Sanderson and Eric. This operation was made possible through invaluable help from our friends Dragan VE3FF, Iulian VA3IUL and Jonathan VE3CBX. Station description: FT1000MP, FT1000MP MkV, MLA2500B, SB220, TH6DXX, R5 and dipoles.